The ever aging Baby Boomer generation is expected to double by 2025. As this generation ages, it brings along a whole set of challenges for their family members. An AARP study found that the average caregiver is a 49-year-old woman who works outside the home and spends nearly twenty hours a week providing care for an aging parent or other family members for at least five years. The person offering the care has the burden of lost work hours or forced into early retirement to provide the care needed for their loved one. I encountered this experience first hand when both in-laws became terminally ill at the same time. Fortunately, we had an active family unit, and many of us pulled together to orchestrate a manageable schedule for everyone. Sadly, not all families have this same support system. The challenge came with the need for multiple doctors’ appointments for both parents. I would find myself leaving work early to take one parent to these appointments and then returning him or her home hours later. There were many weeks when this became a three or four-day task, removing me from my office for a minimum of four hours each time. One day I had a thought that I remember well…., “If I could find someone to transport my parent to and from their doctor’s appointments and I could meet them at the appointment, it would allow me a few extra hours at my desk!” As I looked around the waiting room of the practitioner’s office, it appeared many people were in my exact situation. My personal experience with this challenge and the knowledge of the passenger transportation industry led us to create Express Mobile Transportation. Our family business, Executive Transportation, has existed for more than sixty years. Within that time we have become experts in moving passengers safely and efficiently. 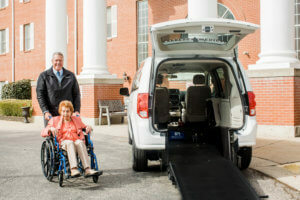 Our corporate clients trust us to serve them with the highest level of care and we are committed to treating our senior and mobility challenged clients with the dignity they deserve. The rapid increase in aging Boomers brings about the opportunity for Express Mobile to partner with those caregivers who struggle with time constraints. Express Mobile’s service is designed to bring peace of mind in knowing that a family member’s care is the same as if a family member was present. The goal is to relieve the pressure from the caregiver for the need to lose work hours, the possibility of having to rely on the unpaid “Family Leave Act” or worse forced early retirement. We understand that life is full of challenges; our main goal at EMT is to help empower you to overcome those challenges. Whether you have a non-emergency medical need such as physical therapy or a doctor’s appointment, or if you simply need wheelchair assistance going shopping, getting to church, or attending a family gathering, we are here to help. Time with those you love is invaluable. Don’t let lack of transportation keep you from a happy and healthy life.